There has been a rise in the number of volcanic earthquakes recorded in Hakone, Japan. The nearby Hakone volcano began belching steaming gas and meteorologists say there is a possible risk of an eruption. There were two minor quakes registering 2.4 and 2.0 recorded at the Hakone volcano, which is located in the Kanagawa Province and is 80 kilometers southwest of the capital Tokyo. Meanwhile, there were a total of 98 volcanic earthquakes recorded at the popular hot springs resort of Hakone on Tuesday up until 15:00 local time. During the whole of Monday, 34 were logged. Japan’s meteorological agency has issued a warning to limit access to the resort. "Activity at Hakone... is in a state of uncertainty," the agency said in an advisory, which was reported by AFP. "There is a possibility that a minor eruption may suddenly occur," it said. "Please do not enter dangerous zones." Despite the warning, the agency still believes the risk of the Hakone volcano erupting is minimal. It is maintaining an alert level at 1 on a scale of 5. Level 1 means “normal." Local hiking trails are also off-limits as there has been a recent surge in volcanic activity. On May 1, just two volcanic earthquakes were recorded; however this figure has been increasing. There were 36 logged on Sunday and 34 on Monday. The figure spiked on Tuesday. The warning comes during the middle of Japan’s “Golden Week” spring holidays and is likely to affect tourism in the area. 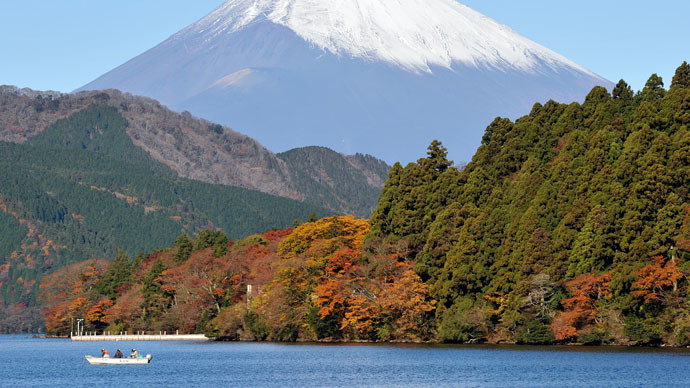 Around 20 million people visit Hakone, which is home to some of the country’s most famous hot springs. In February 2013, 1,400 small earthquakes were recorded around the Hakone Volcano, but there was no eruption. The last one took place around 3,000 years ago. In November, Japan’s largest active volcano, Mount Aso, started spewing ash and stones, which caused local airlines to cancel flights. However, the eruption of Mount Ontake on September 27 eventually killed 57 people, which was Japan’s worst volcanic disaster in almost 90 years. The search for survivors was eventually called off on October 16.